Filters are used in most industries, especially the water, sewage, oil, gas, food and beverage, and pharmaceutical industries. The new edition of Filters and Filtration Handbook is an all-encompassing practical account of standard filtration equipment and its applications. Completely revised and rewritten, it is an essential book for the engineer working in a plant situation, who requires guidance and information on what’s available and whether it’s suitable for the job. Co-published with the Institution of Chemical Engineers. 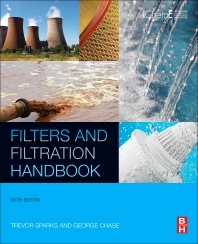 An up-to-date and comprehensive reference covering essential theory of filters and filtration, and including types of filter, media, filtration, equipment, techniques and systems. Trevor Sparks PhD., founder of Filter-Ability Ltd, Ireland, is a consultant within the filtration industry, working for end-users and technology-providers. He has worked in the process industries for 20 years and has focussed on filtration for the last 15 of these. He has previously worked for BHR Group Limited, Larox Oyj (now a part of Outotec), Finland, and as a Marie-Curie Research Fellow at UC RUSAL in Ireland. He is a Member of the Council of the Filtration Society.